Vacation Tracking - DaysPlan, Inc. 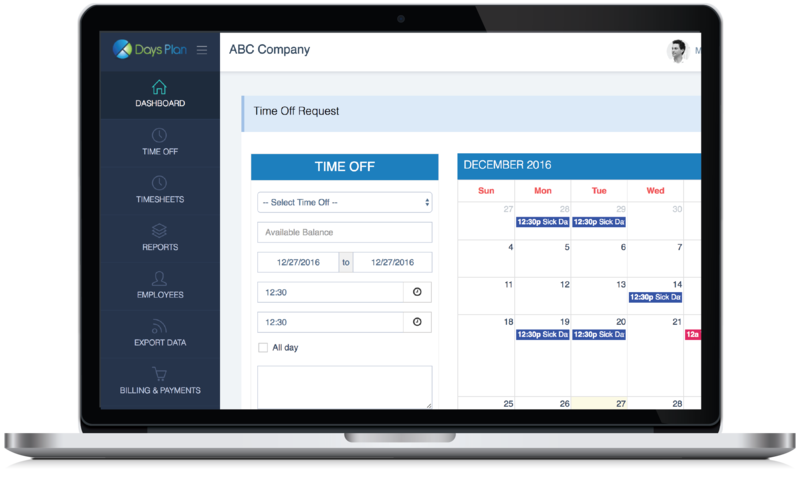 The all-in-one platform for making time off requests, tracking PTO, and syncing with your Calendars. The DaysPlan Vacation Tracking for Leave Management is designed to be a self-service, customizable platform. Onboard your employees, setup your departments, accrual rules and watch the software do the rest. For your employees, the steps are simple and the reporting is detailed, leading to an overall satisfaction for all. We know that the setup process can be daunting for some. That is why, we have a free Data Setup feature for you. You can send us your employee data, accrual policies and let the DaysPlan support team get you up and running. Set up multiple work schedules for employees. Then, create an unlimited amount of time off categories and establish rules for how your staff will accrue that PTO. DaysPlan is cloud-based, so employees can submit time off requests from any computer. Our mobile app makes requesting easy from anywhere. Easily create teams of employees so that your staff can see when other team members will be out of the office. Planning meetings and group work just got a lot easier. Time off requests, messages, and other notifications within DaysPlan also get sent to your email so you can always stay updated on requests and approvals. Easily create a custom spreadsheet of any employee’s time off data for outside use. Start today with a Free Trial. No credit card required.